It was a bit of a surprise that the Pingel Top Fuel final round at the 2018 Manufacturers Cup Finals presented by Kibblewhite paired Mitch Brown and Ian King on South Georgia Motorsports Park’s quarter mile. Brown and his Dennis Bradley-owned bike were both winless, although Mitch did ride alongside Larry McBride’s record-shattering 5.61 in last year’s final in Valdosta. 10X FIM European Top Fuel Bike champion King has won in Valdosta before, but was underwhelming when he devoted a full season to racing in the U.S. last year. 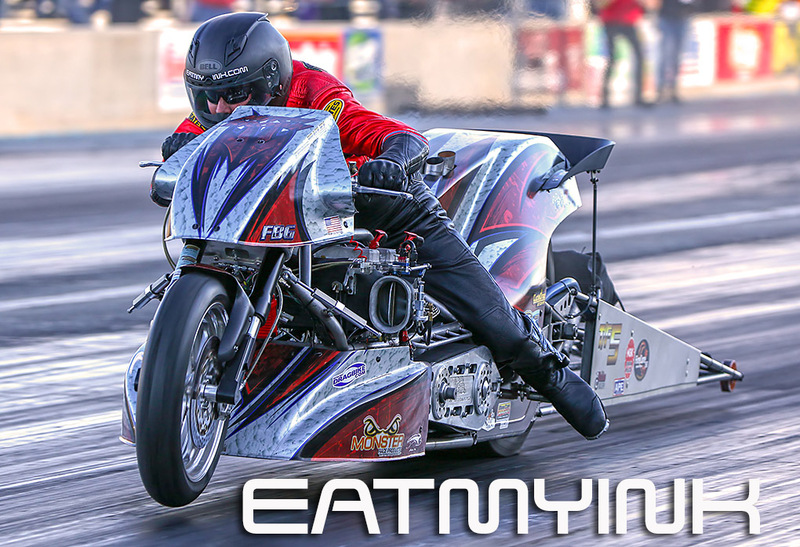 Ian has since sold the bike to outstanding Greek nitro rookie Filippos Papafilippou (who promptly won his first Top Fuel championship) and was doing this race as a one-off deal. Much of qualifying showed King’s team performing much as they had in 2017. But King and team came around on raceday, beating Sam Wills with a fine 5.89 at 232 miles per hour in round 1. Brown won one of the day’s most entertaining races in E1, a coast to the finish for both he and Chris Hand that saw them post identical 7.77s and Mitch winning on a holeshot. Brown raced past Sverre Dahl with a 6.43 in the semi and spent his second of two bullets in the process. Mike Dryden and the Sam Wills team came to the rescue with one of their potent motors so that Brown could race King in the final under cover of darkness. King—with a massive performance advantage—said his bike was wound up on the tire while pre-staged, and as he looked down and released the brake to enact the idle up valve, his bike inadvertently sprung forward into full stage. The tree immediately came while Ian was still preparing and, in any case, he lost traction almost immediately while Brown made ran a 6.20—his quickest ever—to take the win. Don’t forget—David Vantine’s #1 qualifying bike, which missed the championship by 3 measly points—is FOR SALE! Both teams struggled to push back from their burnouts and stage the bikes on SGMP’s radial-style prep. “There was so much glue it was like the bike was stuck to the ground. You could hardly push it into the lights,” said Larry, whose win shortened the points deficit to just 16—less than a round—behind Vantine for Sunday’s eliminations. Norway’s Dahl ended Vantine’s raceday early with a shocking, blow-for-blow, pedalfest win. “That shocked me,” said McBride, who also blew the tire away in round 1 but he had an earned bye and escaped with the round win. The Man Cup struggles to keep up with their points totals, and at this point in the event there were varying opinions about what the championship standings actually were. Did Vantine still have a small lead, or was he now hopelessly down? McBride again was unable to make a clean pass in E2 and lost to King’s 5.95 at 225.33. Now, with both contenders out, the math was crucial, and it turned out that it was McBride with a small four point lead for his 19th championship. “It’s still a championship,” said Larry. “When you win the Super Bowl it doesn’t matter how many points you won it by or what you did in the regular season. It’s that one game that means everything and this race was our Super Bowl. Too bad my flashes didn’t fire on this Larry McBride shot….I love this angle! Chris Hand and team had a decent weekend with the Redneck Express (RNE). After shutting off in the waterbox during Q1, Chris launched off the line for Q2 with a 1.005 60 foot time and was still running hard to the eighth with a 3.83 at 203. Shortly thereafter his #4 quit, then the other 3 follow suit. That was still good enough for a 6.01 at 194, and good enough for #1 until Vantine ran his 5.86. The motor known as “Galahad” failed inspection, so the RNE team put “Merlin” into duty and just missed Q3 by about half an hour, but remained number 3 qualifier. Turns out Galahad had the numbers 2and 3 pistons suffering “nitro plasma cut,” so Chris started building “Galahad” back to fighting condition. E1 for Hand was that somewhat hilarious race against Brown. Chris launches the bike, but it “seemed lazy and almost immediately started dropping holes,” according to Boxell. Mitch had a small lead out of the gate and both bikes expired at about 800 to 1000 feet. Chris ducked under the fairing as far as possible to try and out-coast Mitch, but Mitch won, and then won again. No one caused as much excitement in 2018 in Top Fuel Motorcycle as Filippos Papafilippou, although Jaska Salakari came awfully close. Here’s Fil and his wife bringing some Greek style to Valdosta. Jay Turner had blower belt problems on his two qualifying attempts, which were made in Top Fuel rather than TF Twin. Sam Wills (right) and The Dark Knight himself, Rikard Gustaffson. Rikard is fully mended from his Hockenheim except for a sore arm, and his bike is on the mend as well. …and toting the wheel against King.